Ford is seeing sales growth in what it calls "Super Segment" vehicles - small cars, small SUVs, and mid-sized sedans. Ford says that two thirds of all of its customers begin by shopping for either a Ford Escape or Fusion and generally stay in what the company calls its "super segment" of vehicles - small to mid-sized models. This segment makes up about half of the company's total nationwide sales, up from 35 percent in 2004. The four vehicle segments in the super segment are subcompact, compact, small utilities, and mid-sized sedans. Ford is expecting growth in these segments to continue to grow as the "large car" generation rethinks that in favor of better fuel economy and the younger generation of buyers continues to focus on smaller, more utilitarian models. As combined market segments, the under 25 and over 55 crowd make up about half of the American population (160 million). 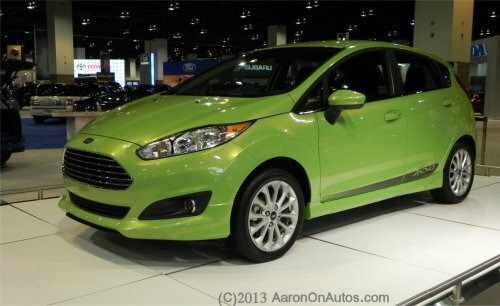 Worldwide, the Focus and Fiesta models of compact cars are best-sellers worldwide. Domestically, the Escape and Fusion are popular models with combined sales of nearly 52,000 units in February of this year alone - about 8,000 more units than the best-selling Toyota Camry and RAV4 had together in the same month. The Escape is the best-selling small sport utility so far this year. Ford has more than doubled its market share in the "super segment" from 2005, boosting sales in the super segment by 123 percent from 2005 to 2012 and gaining a share of 12.7 percent of the whole. So-called "conquest sales" in which buyers leave a brand for another are driving much of the U.S. market growth for Ford. 54 percent of Focus, 52 percent of Escape, and 51 percent of Fusion buyers are leaving other brands in favor of Ford while 63 percent of Fiesta and 67 percent of Fusion Hybrid buyers are walking away from others to buy a Ford. Ford hybrid and electric vehicle (EV) sales are 17 percent of that segment, outpacing overall growth in those sectors. All together, it appears that Ford's strategy of diversifying its model line and focusing on the "super segment" is paying off handsomely.